Road closures and diversions which have been put in place while the long-awaited repair works at the Glen Hotel wall are carried out, have been revealed this week. Work on the retaining wall at the wall on Yarrow Terrace is expected to begin in January after Scottish Borders Council and the owners of the hotel reached an agreement earlier this month. And Souters will be relieved to hear that the completion of the works will mean the reopening of the northbound lane of Yarrow Terrace which has been cordoned off to motorists while negotiations about the wall rolled on. The repairs, expected to last 10 weeks, come at a cost of around £100,000 and will signal a happy ending to the seemingly never-ending row which has dragged on for more than four years. During the initial stages of the repair works, Yarrow Terrace will be closed to all traffic from Ettrick Road to Buccleuch Road, for two weeks from January, 23. Scottish Borders Council’s executive member for roads and infrastructure, councillor Gordon Edgar, said: “This has been a long standing issue but it was important that an agreeable resolution was found for all parties. “We understand the considerable disruption caused to local people while negotiations have been ongoing and thank them for their patience. Alternative traffic management arrangements will be put in place during the closure of Yarrow Terrace, with the alternative route diverting traffic via Buccleuch Road, Mill Street and Heatherlie Terrace to point of closure. The temporary one way order on Buccleuch Road and Mill Street will be suspended for the duration of the above closure. Parking will be prohibited on Buccleuch Road and Mill Street during the closure while access for pedestrians and cyclists will be maintained. 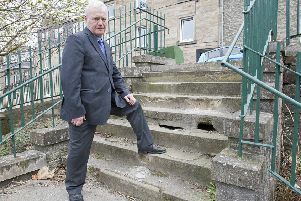 After the wall was found to be crumbling, a protracted argument over who was liable to fix it ensued between the hotel owner and Scottish Borders Council. The wall was sectioned off in 2013, and a section of the road made into one-way system which only served to further infuriate drivers.